Pre-release book party — save the date! 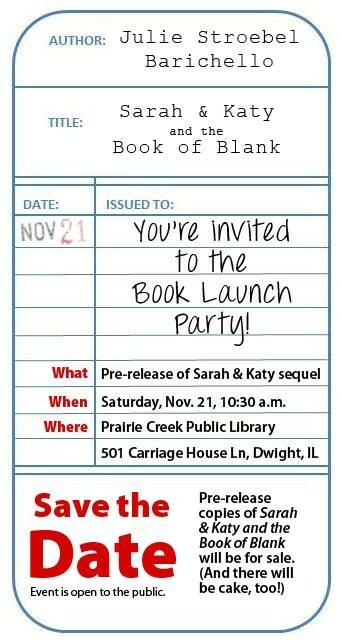 Even though “Sarah & Katy and the Book of Blank” won’t officially be for sale until Tuesday, Nov. 24, there will be a pre-release book party at Prairie Creek Public Library in Dwight, Ill., on Saturday, Nov. 21. Mark the date on your calendars — I hope to see you there! This entry was posted in Reading and tagged Book Launch, children's books, children's literature, kid lit, Sarah & Katy and the Book of Blank. Bookmark the permalink.